Learn More About Greek Chants! The sorority women who sing Alpha Kappa Alpha chants are taking part in a tradition that is over a century old and still represents the values of their founders. In 1908, in Washington D.C. at Howard University there were many obstacles and barriers for African-American women who had any hope for a college education. Nine young women, led by Ethel Hedgeman Lyle, formed the Alpha Kappa Alpha sorority with the intent of forming a sisterhood that would help provide more opportunities for all college women, regardless of ethnicity. Today the chapters are all over the world and there are over 250,000 members of the sorority. They have sponsored many initiatives contributing to public service such as the Mississippi Health Clinic, and their chants reflect the pride and values that have led to these accomplishments. Alpha Kappa Alpha Chants: "A Woman of Glory"
Much like the "Kappa men" chants, many of the lyrics for the Alpha Kappa Alpha's are positive reinforcement for the members. In "To God Be the Glory" for example, the words describe "...a woman of substance, a woman of pride, a woman who is able to put petty things aside." What the Kappas like, what the Ques love..."
The chant goes on to warn others to "watch your man...because your man is watching me," among other taunts, but none of them get to the point of being insulting. 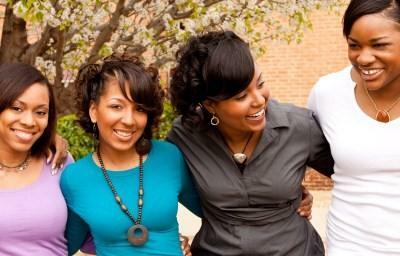 Most of them focus more on the fact that the Alpha Kappa Alpha's consider themselves the "pretty" ones. In Woke Up This Morning they sing the story of how they "Woke up in the morning, and got out of bed. Looked in the mirror and I shook my pretty head." Later on the chant continues "We're not conceited, no, we're just convinced that we're not arrogant, we're awesome." In other words, it's not putting others down - it's just knowing that as Alpha Kappa Alphas they are fantastic in and of themselves. Alpha Kappa Alpha provides opportunities for African American women. While there is a rich tradition of chants and steppin' throughout the fraternities and sororities of historically black campuses, it would be disrespectful for other people to appropriate or try to directly copy either the chants or the dance moves. While they aren't about the step teams, movies like Bring It On make it clear that inspiration is cool, but imitation is lazy. Other places to see the pride and power of step teams and their competitions are in movies like Stomp the Yard, which gives a good portrayal of the way young people grow within these organizations.